The Storkcraft 3-in-1 Activity Walker with Jumping Board offers far more than your typical walker. An entertaining toy tray, jumping board, and rocking feature are all combined to give your little one the ultimate interactive experience. 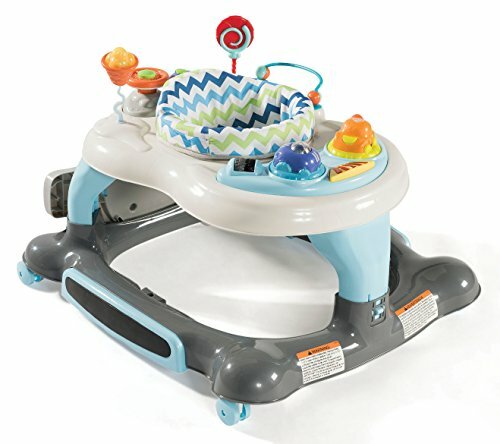 Let your baby enjoy the fun rocking feature while the entertaining jumping board is in place. The electronic toy tray will help stimulate your child's senses and accelerate their early development while the 360-degree swivel seat makes it easy for your little one to reach all the different toys. The toy trays include an interactive steering wheel, an ice cream cone, a lollipop teether, cars and buttons with sounds. This walker is equipped with a three-position adjustable height to grow with your baby, while the jumping board and rocking function effortlessly click into place.